Revealed: the secrets of the most famous grand feu enamel dial maker in the industry. Donzé Cadrans is quite possibly the most famous and fabled of all the grand feu enamel dial manufactures in the industry. Donzé began in 1972 when Master Enameller Francis Donzé founded Donzé Cadrans S.A. It was then a very niche business which would become world recognized for its superior capabilities as an enamel-dial specialist, particularly in ancient and high horology watch dials. A mere ten years after its founding, daughter Francine and her husband Michel Vermot joined the family venture as Francis pursued his artisan work on watch dials until his retirement in 1987. 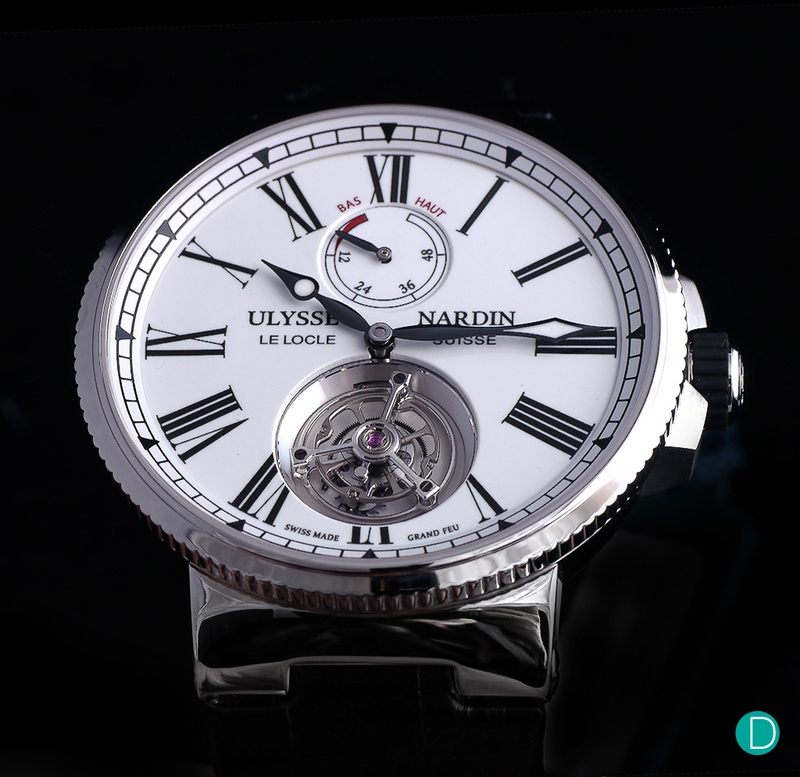 And in 2011, Ulysse Nardin acquired Donzé Cadrans S.A..
Hidden somewhat in the idyllic scenery of Le Locle, the Donzé Cadrans manufacture looks like a house. This facility, shown in the photograph below was consolidated from two workshops when Ulysse Nardin purchased the company in 2011, and remain the location for its production facility today. 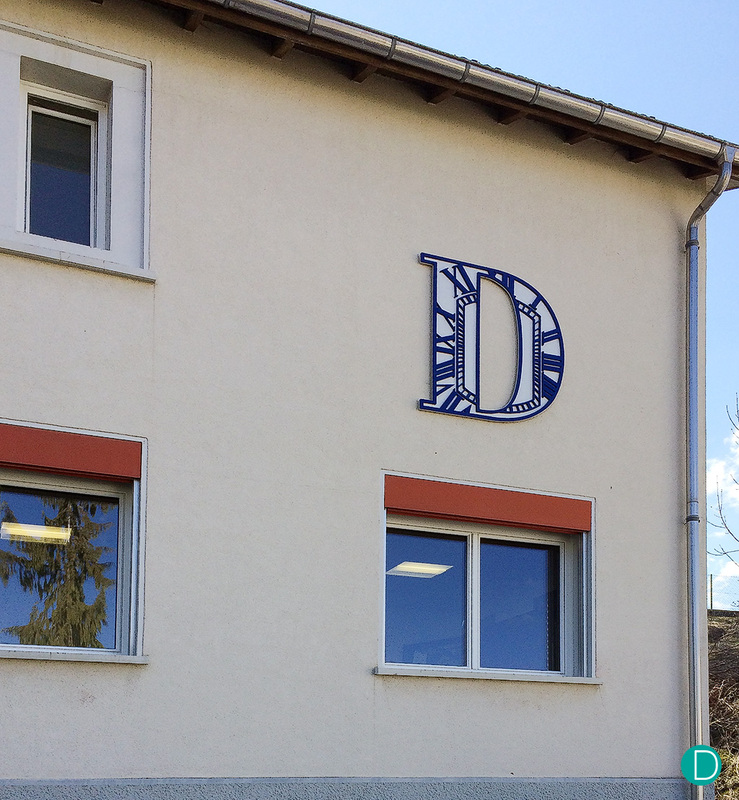 The Donzé Cadrans started in 1972 at 36 Rue de l’Avenir, Le Locle. Enamel is a soft glass comprising of silica, red lead and soda. When mixed together with other elements, enamel takes on a persona with intense hues and a subtle, yet magical depth. The elements are used to add colour to the enamel, and include iron which produces a gray color, chromium which creates a green color and iodine which makes a fiery red color. Fired in an oven at 800-1200°C, it liquefies and bonds to the metal base, and when cooled becomes an extremely hard wearing, brilliant material which never fades. We have seen pieces in museums which are centuries old, which still shine brilliantly today as they did when they were made. The enamel as powder in diverse colours. 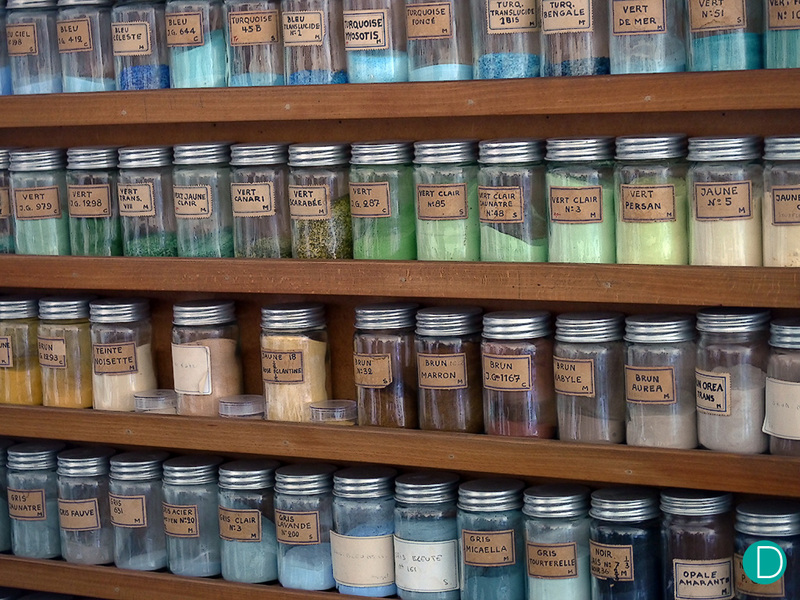 What makes the processes more interesting and difficult is that the powders, once fired and hardened as enamel may not be the same colour as what they look like in the bottles. And the artist will have to manage this. The problem is that the manufacture process is incredibly hard to control. Repeated firings are necessary between each application of enamel to build up a certain thickness. And each time the dials are fired in the oven, there is a high risk that they may crack, air or gas bubbles may emerge and leave tiny holes, or the resulting colours might not be optimal. The colour equation is also made more complex in that the final colour after firing may not be the same as the colour of the enamel in the bottles, or even after heating. The final colour is obtained after the dial has cooled to room temperature, and the artist has to know what this colour will be when he does the mix. This results in a very high rejection rate, which makes the surviving dials very expensive. As an example, we have heard that the rejection rate of the dials made for the Langematic Anniversary (made by Donzé) announced in Baselworld 1999 were upwards of 90%. Having to make 100 dials to be able to produce 10 good ones results in very expensive dials. 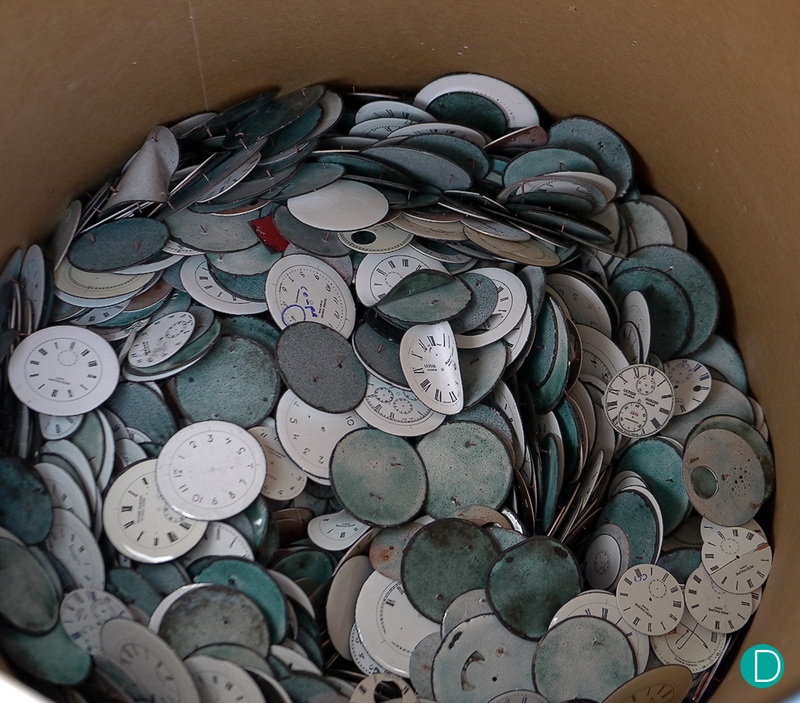 A bin of discarded dials, which have some defect of some kine. On examination, some of the dials look perfect to our untrained eye, but have been rejected by the specialists for small flaws. Four main types of enamel techniques are used for the manufacture of dials. cloisonné, grand feu. champlevé and flinqué. Donzé has mastrry over all these techniques, but in this article we will focus on the grand feu, or great fire. 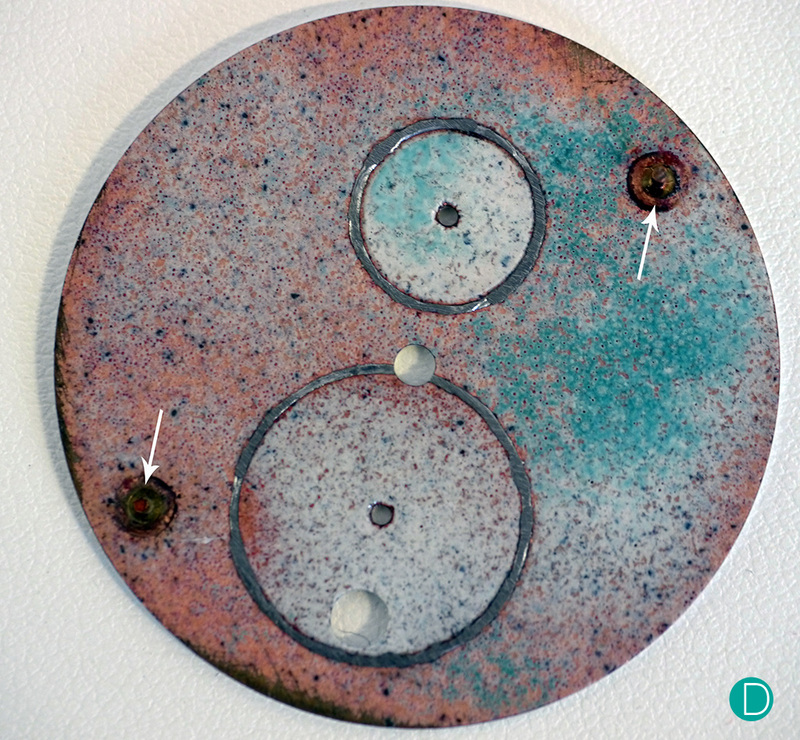 The dials begin as round copper discs which are stamped out from a plate. Small feet are soldered on the under side of the plate, usually two feet are used, although Speake-Marin watches are designed to use three feet. 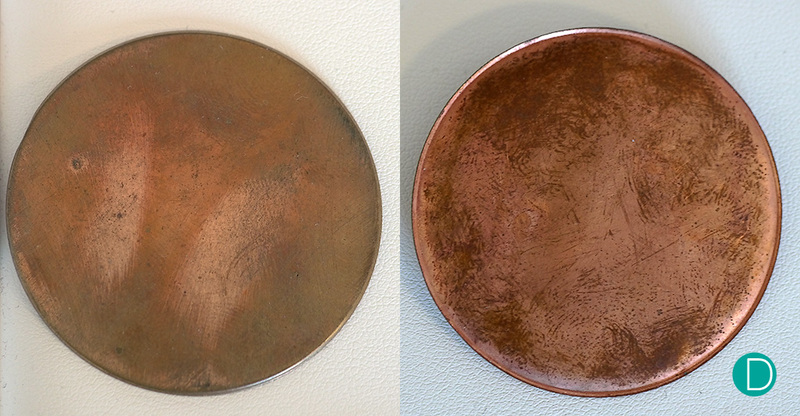 These copper discs are then cleaned in an acid bath. This process is important as dirt on the base plate can cause the enamel to crack or render it porus. The acid must be rinsed off as it can cause transparent colours on the enamel to appear cloudy. The copper discs. Left shows one which is just stamped out. On the right is the disc with legs soldered on, and cleaned after the acid bath. 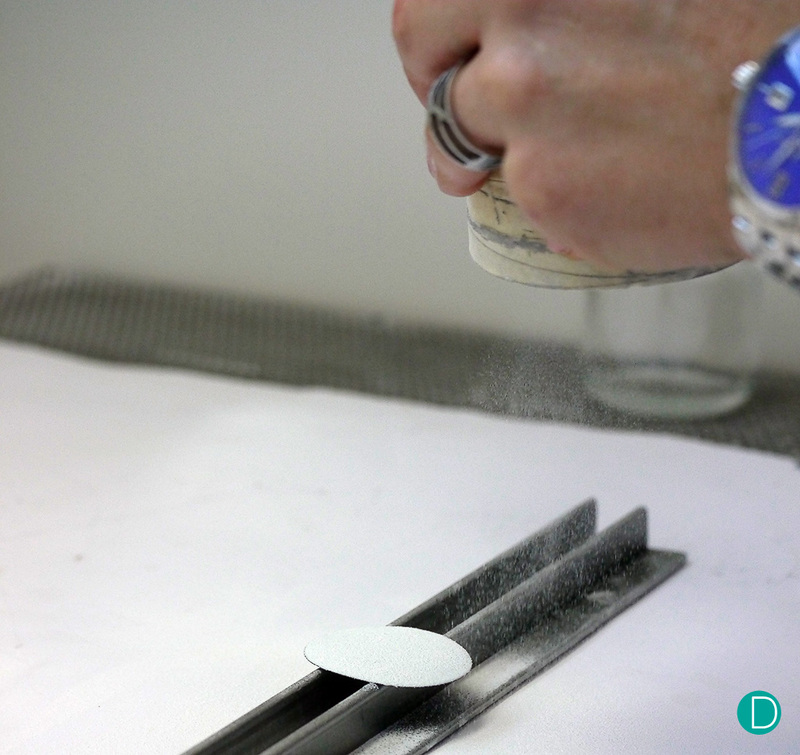 The discs are then coated with a dusting of fine enamel powder. This is not dis-similar to dusting caster sugar as icing on a cake. Dusting of the dial with enamel powder. In this photograph, the dusting is the second or third layer. Each layer is fired in the oven and a potential for faults to occur. As the powder is light, a small mist of alcohol is applied to the base copper plate before sprinkling to ensure that during transport from the dusting table to the oven, the powder does not fly about, but sticks to the dial. The dials are inserted into the oven for firing. The dials are then inserted into the oven, which look quite similar to a pizza oven. We joked with the lady in charge of the firing that she waas making pizza, and she jested that she bakes pizzas for lunch in the oven. Of course it is just a joke, the oven is kept immaculately clean to avoid any contamination on the dials. When we were visiting, the temperature was set at 880°C. 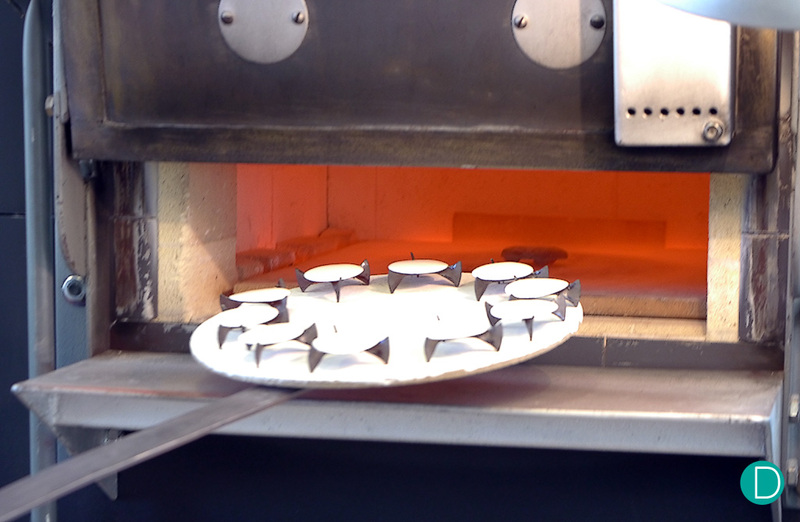 The first firing is a foundation which is necessary to prevent the disc from cracking and to bind the enamel to the disc. A beautiful burst of flame erupts from the alcohol burning off, as seen in the short video below, giving rise to the name grand feu, or big fire. After the firing, the dial is flattened with a small hand tool by the skilled operator, and examined for flaws. Flawed dials are rejected. Those which make it will be coated with another layer of enamel powder, and fired again. Each time, the spectacle of the grand feu occurs in the oven. The process is repeated until the required thickness is achieved. Up to 6 or sometimes 8 firings may be needed, and the minimum is usually 3. 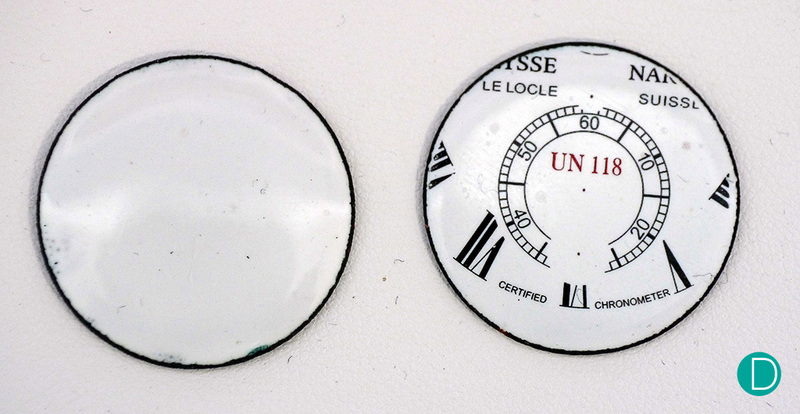 On the left is the dial with the first coating of enamel after firing. On the right, after 6 coats of enamel. The characteristic sheen and inner glow of the enamel can be clearly observed on the right dial. The enamel dials are then sent for printing. 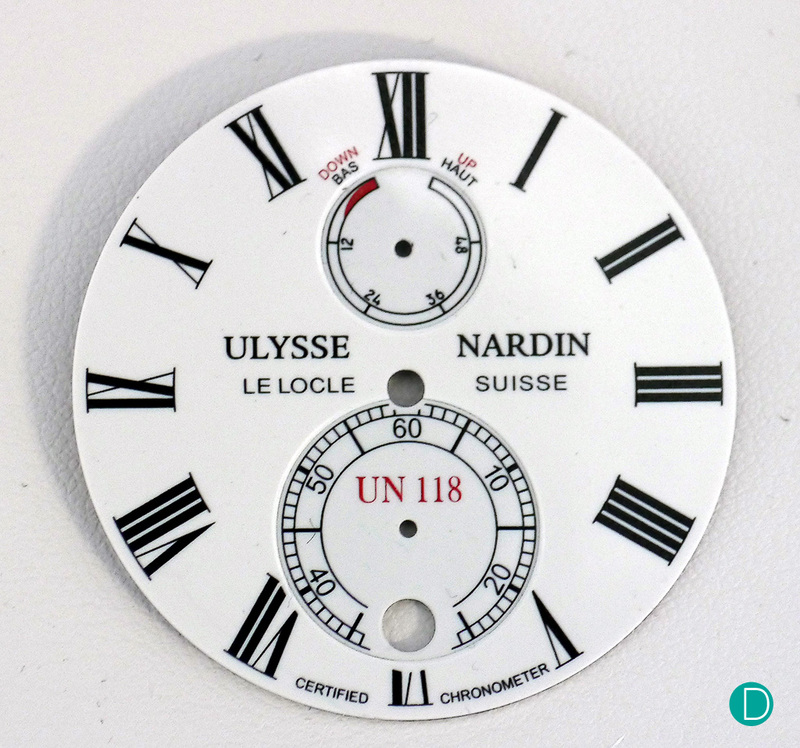 The markings are printed on the dial using enamel powder and oil using a standard transfer printing process. A separate print impression is made for each colour present on the dial. The dial is fired after each colour is applied, but at a lower temperature, typically 100°C lower than the initial firing. This is to ensure that the enamel paint is permanent. At this stage, the danger of the dial cracking is very real and possible. If this occurs, the dial is discarded, nullyfing all the prior work done. On the left, the dial after two printing passses for red and black enamel paint is complete. And on the right the subdials, which are small dials on their own are cut out, and the edges of the cutout chamfered and polished. The right dial is also trimmed to correct size. The right dial appear larger because the photograph is a composite of two separate photographs. After printing, the center hole is drilled and the edges trimmed to the specified size. This is done with a fast turning diamond drill with water as a lubricant. The subdials are then cut out and the openings are finished with a bevel. Again the possibility of breaking the enamel is still very real. The subdials themselves are small dials made in exactly the same way. The only difference is the subdial is the size and thickness of the subdial, so that when attached, it is countersunk slightly below the surface of the main dial. The subdials are made in exactly the same way, as small dials. 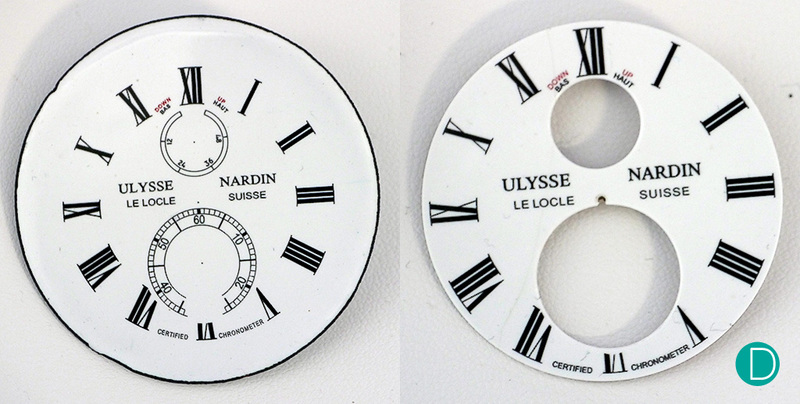 On the left the completed grand feu subdial, and on the right with two colours printed and fired. Note that on the dial on the right, a space is left for the date aperture, which will be drilled after this stage. The opening will also be chamfered and polished. The subdial is also cut and the edges are bevelled in the opposite direction as the main dial. The parts meet to form a v-shaped grove on the rear of the dial and filled with a soft solder, and soldered in place. The back of the completed dial, showing the feet (white arrows) and the subdials held by soft solder. The final product, a beautiful grand feu enamel dial, with its beautiful sheen and inner glow. A dial which will remain like this centuries from the day it was made. The UN Marine Tourbillon sports a dial made in a similar way. Here two colours are applied, and only one subdial for the power reserve indicator. A large opening is cut for the tourbillon. Note the chamfered and polished edge of this aperture.